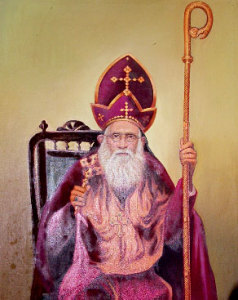 Alvares Thirumeni had a firm faith in the Orthodox Church. Leaving his fortune in the Catholic Church, he embraced the Orthodox Church. He was excommunicated and persecuted. He was falsely abdicated, arrested, stripped off his Episcopal vestments and taken through the street, only with his underwear, to the police lockup. There he was put in a filthy room without a bed or chair wherein the floor smelt of urine and faeces. He was also forcibly deprived off his cross and the ring, the episcopal insigne he was wearing. He was beaten and presented in the Court. But the Government could not prove the allegations and he was acquitted. After few days he was caught again on alleged charges of high treason but this time too the Justice found him innocent. He was not allowed to use his Episcopal Vestments till his death, he used only a black robe. He suffered alone as forsaken by everybody, just like his own Master, Jesus. As a true Christian, Alvares Mar Julius Thirumeni suffered like the Disciples and Martyrs of the early Christianity. Antonio Francisco Xavier Alvares (Alvares Mar Julius) was born on April 29 1836 to a Goan Catholic family in Verna, Goa, India. He was initially appointed as a priest of the Roman Catholic Church in Goa.Â Alvares thirumeni was appointed by the Archbishop of Goa to minister to Catholics in territories of British India. The Portuguese Crown claimed these territories by virtue of old privileges of Padroado (papal privilege of royal patronage granted by popes beginning in the 14th century). The more modern Popes and the Congregation of Propaganda Fide separated these areas and re-organized them as Vicariates Apostolic ruled by non-Portuguese bishops, since the English rulers wished to have non-Portuguese bishops. When, under Pope Pius IX and Pope Leo XIII, the hierarchy in British India was formally re-organized independently of Portugal but with Portuguese consent, a group of pro-Padroado Goan Catholics in Bombay united under the leadership of the scholar Dr. Lisboa e Pinto and Fr. Alvares as the Society for the Defense of the Royal Patronage and agitated with the Holy See, the British India government and the Portuguese government against these changes. Their agitation failed to reverse the changes. While he was a priest of the Catholic Church he was in search of the true Biblically Christian One, Holy, Catholic and Apostolic Church. He was against the false devotion and religious exhibitionism. He objected to the Concordat of the Pope and interference of the Government in the Church Administration. He could not withstand the harassment meted out to him by the ecclesiastical and civil powers. He went to Western and Eastern Churches and finally came to Malankara and joined the Orthodox Church. Being pious and considering his faith, his way of life and attitude towards his fellow being, he was consecrated as Bishop by Mar Joseph Dionesious (Pulikkottil), Geevarghese Mar Gregorios of Parumala, Mar Paulose Evanios of Kandanadu and Mar Athanasios (Kadavil) at Kottayam Old Seminary on 29 July 1889.He was elevated to the position of Metropolitan (Arch Bishop) with the jurisdiction of Goa, India (excluding Malabar) and Ceylon. Thirumeni lived at Colombo and Brahmavar-Calianpur (Kalyanpur), a village near the town of Udipi in the Canara Coast till 1913, and then moved to Goa. This designation was given to Alvares Thirumeni by Goan historians. After joining the Orthodox Church Thirumeni was excommunicated by the Roman Catholic Church. He was persecuted by the Catholic Church and the Portuguese Government. Though he was advised by some off his old friends to reunite with the Catholic Church, especially when he was very sick, he refused and stuck to his Orthodox faith. Â Since Thirumeni was not allowed by the rulers to work freely in Goa Â he was mostly based in Canara region of Karnataka with the main base at Brahmawar. He along with Fr. Noronha a dear friend of Thirumeni Â worked among the people along the west coast of India from Mangalore to Bombay. About 5000 families joined the Orthodox Church from this region . The region now falls under the newly formed Brahmavar Diocese and has strong Orthodox Christian population. Mar Alvares Thirumeni had ordained two priests and a deacon from Travancore-Cochin area for Malankara Church. Besides Rev. Fr. Kanianthra Joseph Alexander, Rev. Fr. Lukose of Kannamkottu and Rev.Dn. David Kunnamkulam were the ones ordained by Mar Alvares. Fr. Kanianthra Joseph later became a Cor-Episcopa and was the Vicar General [from 1949 till his death in 1955] of the Niranam Diocese of late Thoma Mar Dionysius of Malankara Orthodox Church. In 1892, Mar Alvares consecrated an American Priest, Joseph Rene Vilatte, a native from Paris, who was titled as Mar Timotheus, Archbishop for the Church of the Mother of God in Wisconsin of the Archdiocese in America, with consent of Jacobite Patriarch H.H. Peter III of Monastery of Sapran at Mardin of the border of Syria and Kurdistan. He started a number of periodicals including A Cruz (The Cross), Vardade(The Truth), O Progress De Goa, O Brado Indiano, Times Of Goa. Most of them were educative and supportive for the right of the public. As he was a critic of the Government, most of them were banned and forced to stop publications after few years. The Universal supremacy of the Church of Christ, Antioch and Rome were two of his books. Alvares Thirumeni was a great Scholar, man of high principles and had an impressing personality. He opened a college where Goan priests were teaching Portuguese, Latin, French and Philosophy. In 1912 Mar Julius opened an English School in Panaji. Both did not function for long, due to one reason or other. At that time Goa was frequently affected by epidemic like malaria, typhoid, small pox, cholera and plague. Alvares published a booklet Direcoes Para O Treatment Do Cholera(Directions for Treatment for Cholera). He was so concerned about shortage of food in Goa that he appealed to the people to produce cheaper food.He published a booklet Mandioca(about the cultivation of Tapioca). Â Though Portuguese Government dubbed him as a traitor, later he was considered by them and by all the Goans as an â€˜Apostle of Charityâ€™. In 1871 he started a Charitable Association in Panaji to render help to the poor, beginning with wandering beggars. After few years he extended the Association to other cities in Goa. During the last ten years of his life he concentrated his activities in Panaji. His home for the poor was having lepers, T.B patients, scavengers, beggars and all other destitute s as inmates. Since he was not having any income he was forced to beg with a bowl in his one hand and a staff in the other hand for support. One day Mar Alvares requested a shop keeper for contribution. Instead of giving any money, the arrogant fellow spat in the bowl. Without getting angry His Grace told to him â€œAll right, I shall keep this for me. Now, give something for the poorâ€. (He was very much ahead of Mother Teresa in that respect). By seeing the dedication and determination of the Arch Bishop the shop keeper contributed generously. Â His last days were in Ribandar Hospital, a charitable institution, ill with dysentery. It was his wish to be buried by any Orthodox designates, he was specific not to have any Catholic priest for the same. He died 23 September 1923. 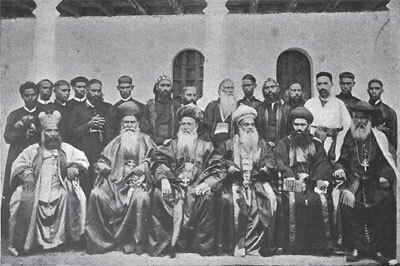 The citizen committee led by the Chief Justice, arranged a grand funeral. His body was kept in state in the Municipal Hall for 24 hours to enable the people to pay homage. All the newspapers were full of articles and homage about the departed. Though Thirumeni was considered an enemy by the government, the Governor General sent his representative to pay tribute to him. Thousands of people especially poor and beggars paid their last respects. Funeral speeches were made by high dignitaries. The funeral procession winding all the main roads of Panaji was taken and the body was laid to rest in the secluded corner of St. Inez Panaji cemetery on 24 September 1923 without any funeral rites. After four years (23 September 1927) his bones were collected by his friends and admirers, placed in a lead box, buried in the same place, under a marble slab with the inscription â€œEm Memoria De Padre Antonio Francisco Xavier Alvares, Diue Foimui Humanitario Missionario E Um Grade Patriotaâ€(Padre Alvares a great Humanitarian Missionary and a great Patriot) and a large cross, still the biggest cross in the cemetery and is said to be donated by a very dear hindu friend of the thirumeni. For forty long years nobody visited the grave. Some research at the initiatives of late H.G. Philipose Mar Theophilus and H.H. Basalios Marthoma Mathews I prompted Rev. Fr. K.M. George and Rev. Fr. T.E. Issac, the then parish priest at Goa, to fish out the location of the burial. The tomb of Alvares Mar Julius was discovered on January 1, 1967 from St. Inez Municipal Cemetery, Panaji, Goa by H.G. Mathews Mar Athanasios. 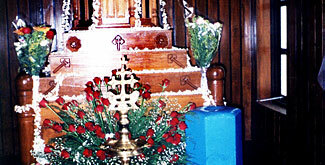 The Holy Relics were translated from St.Inez Cemetery to St. Mary’s Orthodox Church, Panaji by Philipos Mar Theophilus on October 5, 1979.When the St. Marys Church was reconstructed in the same place, the relics were shifted to the present sepulchre which was specially made on the side of the Madbaha, by the Catholicos of the Malankara Orthodox Church H.H Moran Mar Baselios Mathews II on 6 October 2001. The Holy Relics of the metropolitan has been entombed at the St Mary’s Orthodox Church in Ribander. Although congregation is small, the “Orthodox Church of Goa” has survived almost a century after the death of Bishop Alvares. The St. Marys Orthodox Syrian Church, Ribandar, Panaji celebrates his Dukrono (Memorial Feast) every year in September, during the week falling 23rd to honor this great Apostle of charity and Martyr.